Every time I visit Alewife I leave with mixed feelings. Did I just visit an awesome bar? Did I just eat at a great restaurant? Did I do both at the same time? The debate is on going even as I write this. On this particular visit we were greeted in a semi-scattered brained way. "No. We were just hoping to find a seat." I wasn't sure if that meant forget it they weren't seating anyone else for the rest of the night, but I didn't have time to ask because the hostess ran away before I could open my mouth. Deana and I walked down near the entrance/exit to discuss our options for a few minutes and right as we were about to leave the hostess came back wondering if we still wanted to sit down. We said yes and took our seat, but the whole exchange was odd. Oh well. We were there to eat and after looking over the menu the call for red meat overcame both of us and we decided on the Smoked Burger. My great hamburger gauge is controlled by Hamilton Tavern's burger. Happily, I can report that Alewife has a burger that gives Hamilton all they want as far as burger battles are concerned. For my money, they don't quite edge them out, but they put up one hell of a fight. This is definitely one of the top burgers in Baltimore. Alewife's Smoked burger, as they would say in NBA Jam back in the day, is on fire. It's thick, juicy, topped with fantastically gooey Gouda and Gruyere cheese, the crunchiest bacon, caramelized onions, and accented perfectly by a faint smokey flavor that separates them from most other burgers. 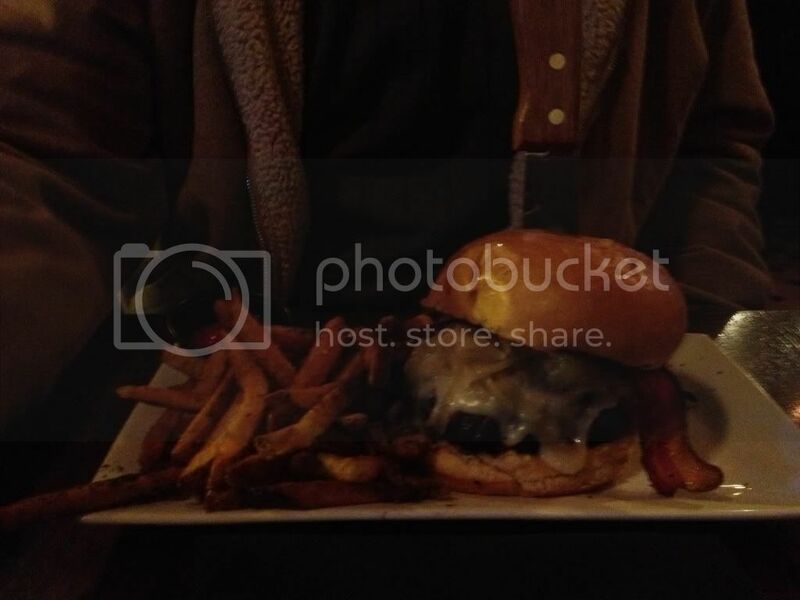 And did I mention that it's a huge 11 ounce burger? As far as Alewife and it's bar scene is concerned, though, I never feel the need to visit them simply to get a drink despite the fact that have 40 or so beers on tap. It's always crowded and parking in the area isn't the greatest. It's just not convenient for me and unless you live in that area I doubt it is for you either. That stinks, but it's no reason to stay away from Alewife. Every time I've been there the food has been delicious and there are plenty of quality craft beer options to pair up with. Just be sure to make reservations first. Recommendation: Great place for a beer and quality food. The Session #77 - IPA: What's the Big Deal?